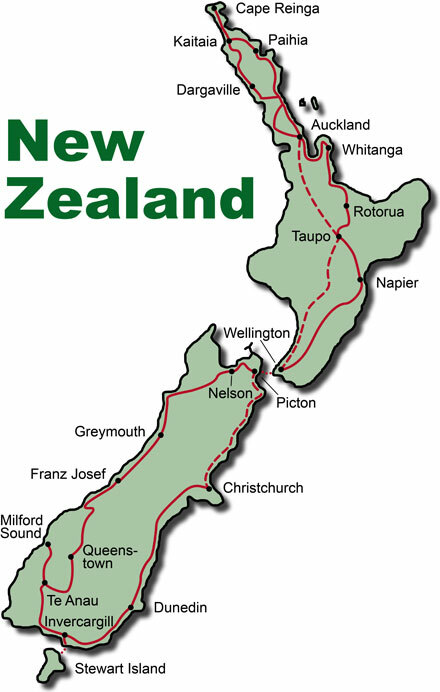 The KeaRider motorcycle tour through New Zealand is paradise for motorcyclists at the other side of the world: You will quite intensively get to know the two large islands of New Zealand as well as Stewart Island on this 18 day road trip - from the northern tip at Cape Reinga to the beautiful landscapes on the southern island. During the motorcycle tour, gain insight into the indigenous culture of the Maori, discover natural wonders such as the geysers of Rotorua and have the opportunity to bungee jump or skydive. Of course you will also visit the famous Milford Sound in the south and exciting cities such as Christchurch, Auckland and the capital Wellington. The KeaRider Paradise motorcycle tour in New Zealand is ideal for those who want to really get to know this fascinating country. After an individual journey, tour participants meet in Auckland and drive north to the Bay of Islands, where you will spend the night in Paihia. Today you will visit the Waitangi Treaty Grounds, where the Maori and the British once signed the founding of the colony of New Zealand. Overnight stay is in Kaitaia. The tour leads you to the northernmost point of New Zealand, Cape Reinga, where the Maori believe is the gate to the underworld. Via the Twin Coast Discovery Highway you will cruise back south to the Waipoua Kauri Forest, where you will see the 2000 year old tree, Tane Mahuta, the "God of the Forest". After spending the night in Dargaville, you will head back to Auckland, where the rest of the day is free to your disposal. Cruise through the beautiful surroundings of Coromandel to Whitianga on the Pacific Coast Highway and just enjoy nature. Today several highlights await you: the Cathedral Cove, a unique rock formation on the coast, and the sulphur-bearing roaring geysers of Rotorua. In the evening, visit a Maori village and learn more about the culture of the natives. From Rotorua you will pass Te Puia to Lake Taupo and the 2797 m high Mount Ruapehu to Napier, a city that after an earthquake in 1931 was completely rebuilt in the art deco style and has many places of interest. After spending the night on the picturesque promenade of Napier you can cruise fully relaxed to Wellington, the capital of New Zealand. You can visit the Te Papa National Museum in Wellington, before you cross over by ferry to the southern island and drive from Picton to Nelson, the sunny capital of New Zealand motorcyclists. The day in Nelson is free to your disposal. You can see the city or take a trip to the Abel Tasman National Park. Today you leave Nelson on the famous Buller Gorge Road, which leads past the Tasmanian Sea and Cape Foulwind to the Pancake Rocks, where the seawater blows through holes in the rocks into the air. Accommodation is in Greymouth. You can enjoy pure nature in this beautiful area driving past the gold mining town of Ross to the Franz Josef Glacier, which you can get to know better during a helicopter flight. The trip today leads to the Lake Wanaka and on a deserted mountain road on to Queenstown. Here you will gain insight on the life of a New Zealand sheep farm, the most important economic activity in the country. After a relaxing morning in Queenstown we head around noontime to Te Anau in the deep south. Now on the agenda is a visit to Milford Sound, a UNESCO World Heritage site: you will discover unique fjords on a boat trip and watch penguins, dolphins and sea lions in the wild. You will continue to Invercargill with an option to visit the nature island Stewart Island in the far south of New Zealand. Here you can take a scooter tour and observe untouched nature i.e. rare bird species. Today you will have a close up view of Burt Monro's original motorcycle from the cult film "The World's Fastest Indian" with Anthony Hopkins. Afterwards you are heading through the Catlins on to Dunedin. Your motorcycle tour ends with a last ride to Christchurch, where you start your individual journey back home.